Ahem Ahem if you are pregnant or if you know someone who is about to have a baby then this post is surely for you dear, do have a look. Motherhood is the best phase of a women's life, a women's life is not complete without this chapter. Its a totally new chapter with a new member in her family many new challenges are led on her way and with this one of the most difficult one is to come to her pre pregnancy figure or body shape again. Even i am a mother to a baby girl who is going to be 3 very soon, and believe me i still want to look like i was before my pregnancy, ah i so much wish to get into my old jeans again, i wish i was aware of these stuffs that time which i am now going to introduce you guys. Postpartum girdle also known as post pregnancy shape wear are being advised by doctors these days after giving birth. Post pregnancy belt are specially designed for pregnant ladies to help them keep their lower abdomen in shape after giving birth. So you see guys this post pregnancy belt can be very usefull for you all as it noy only help in keeping lower abdomen in shape but also in improving muscle tone, reducing postpartum uterus pain and giving a good support to your back too. These sort of abdominal belt after delivery for women are available everywhere now a days very easily, like you can buy it at any medical store or can just order it online , these are of various types you can just check which suits you the best, well if you buy it online then you have the chance to select from a variety of range available with different colors too which can be delivered to you easily. 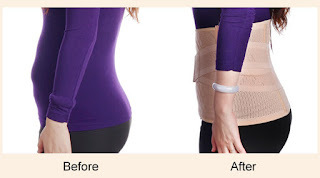 Do you guys know this if you have abdominal obesity or have loose abdomen then also you can use postpartum girdle for yourself in your day to day life and and can look more into shape with the help of it. it just comes as a belt which you can wear inside your dresses also known as tummy belt wraps. Guys we should spread this superb product with our friends and family so that they can use this product and take advantage of it. And if your friend/sister is pregnant then i would suggest to gift this product to her , she will surely thank you whole of her life for this. Have anyone of you tried this product before ? Do let us know in the comments section below.